You can help bring miniature horses to see the kids! Pet therapy helps kids heal and just be kids again! 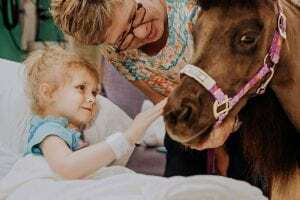 Children are especially excited when they see the Miniature Horses come to the Children’s Hospital! We would love to bring Heartland Minihoffs in once a month for a year and with your help we can! Help us raise funds by donating here! Previous post: Jayden says thank you to corporate partners and programs!